Reserve your spot NOW and pay in venue LATER…. Well beware Scotty cause your excuses have all dried up… You can now use our ‘Pay in Venue’ option when booking online. This eliminates the ability for Scotty to slowly weasel himself out of not paying… Scotty show me the money! Pay in venue is a super easy option for you to use when booking online, simple as a-b-c.
A: Click here to start your booking >> this is where you need to choose the date, time, activity, how many players and how many games you would like to play. Keep an eye out for our awesome deals, as they may up the ante on your Kingpin adventures. 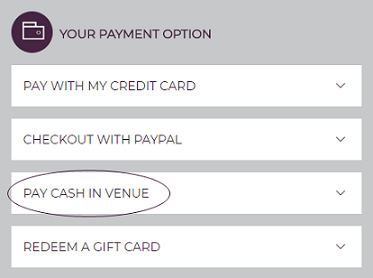 C: Bring a digital copy of your reservation into venue and a way to pay the total amount in venue. Couldn’t be easier if we tried… Now time to sort Scotty out… Oi get back here with that wallet. *Please note that pay in venue is not available at Kingpin Crown, for escape rooms, with the purchase of any food platters or when a partial payment with a gift card in made.